A wide range of Analog Measurement Devices are available to allow connection of most sensor types. Some of the single channel Analog Units also have Digital I/O on-board for triggering and alarm reporting. This Thermocouple Input module is ideal where only a single temperature (or voltage or current) needs to be monitored. The unit has an integral Digital Input channel to accept an input from a switch/relay or similar. This Thermocouple Input module is applicable where only a single temperature (or voltage or current) is to be monitored. The I-7011PD has an integrated 4½ Digit LED Display to display values. 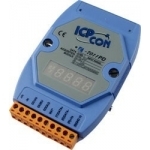 The I-7012F is a single channel analog Input module for measuring thermocouple, dc voltages and current. Optionally it can run in fast mode (100 sample/sec rather than 10 sample/sec) by using the ADC in 12-bit mode. This Analog Input module is ideal where only a single voltage or current needs to be monitored. It has the option of running in fast mode (100 sample/sec rather than 10 sample/sec) by using the ADC in 12-bit mode for applications where a faster sampling rate is needed. This RTD Input module is ideal where only a single Higher Accuracy Temperature needs to be monitored. This RTD Input module is ideal where only a single High Accuracy Temperature needs to be monitored. This Analog Transmitter Input module is ideal where only a single Input from a 2-wire Transmitter (e.g. 0-10Vdc or 4-20mA output) needs to be monitored e.g. some Gas or Temperature sensors. This RTD Input module is ideal where 6 channels of Higher Accuracy 2/3 wire RTD Temperatures need to be monitored. This Strain Gauge Input module is ideal for small Strain Gauge Applications. This device provides 8 channels capable of receiving 4-20mA inputs from a wide number of sensors with this type of output. No external resistors are required as they are fitted internally. This module provides 8 differential channels, capable of receiving data from sensors outputing Voltage or Current (via use of an external resistor) depending on the device mode selected. This device provides 8 channels capable of receiving 4-20mA inputs from a wide number of sensors with this type of output. This unit has 8 channels capable of measuring Thermocouples, Voltage or Current, depending on the module configuration. 10 channel Thermocouple Input module, which has individually configurable channels for Voltage and 4-20mA measurements, as well as Thermocouple. 8 channel Universal Input module, which has individually configurable channels for Voltage and 4-20mA measurements, as well as Thermocouple. This unit provides a single Analog Output channel with 12-bit resolution and current readback function. Analog Output Module, 2-channel, RS485 Interface, wide range of software drivers. Analog Output Module, 4-channel, RS485 Interface, wide range of software drivers. This RTD Input module is ideal for monitoring multiple Higher Accuracy Temperatures using 2, 3 or 4-wire RTD's. Temperature/Humidity Data Logger with LCD Display, IP66 casing & RS485 (DCON) communications for configuration and download. Utility included.